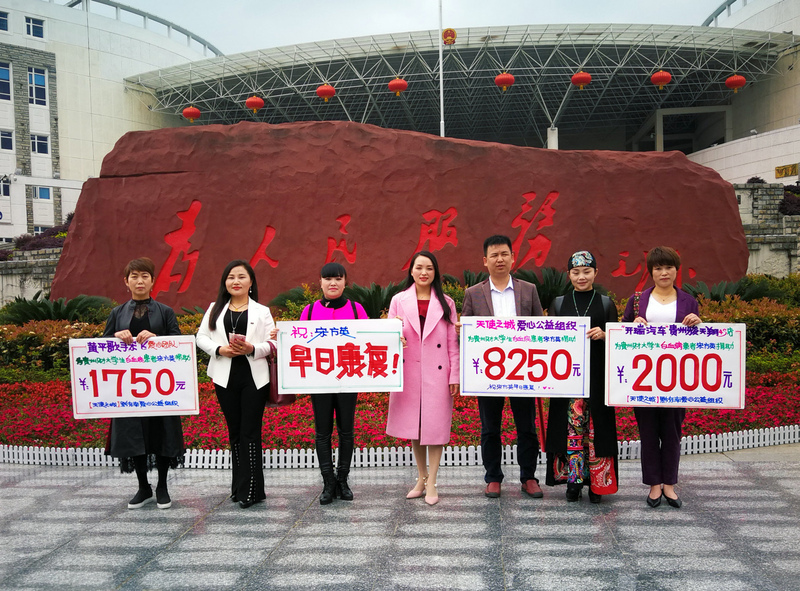 Representatives of donors hold signs listing the amount of money donated to a disabled woman, in Guiyang, Guizhou province, April 11, 2018. Extraordinary times call for extraordinary measures. Xi Jinping seems to have embraced this aphorism with gusto. At the 19th Party Congress in October of last year, and the 13th National People’s Congress in March, held in the midst of tumultuous changes in the U.S.-China relationship, Xi took extraordinary measures to concentrate power in himself and the Party in a herculean effort to catapult China into a “new era of socialism.” He had his ideas enshrined in the Constitution, removed term limits on the Presidency, and carried out an unprecedented reorganization of the government. Given his past animosity towards civil society, Xi’s actions have been seen by some as moving China towards a new form of totalitarianism and a closing of the space for civil society. I would argue instead that we should see Xi’s ascendancy, together with previous policies carried out during his last five years as General Secretary, as advancing an ambitious effort to remake civil society in the Party-state’s image. Whether he succeeds will depend to a large measure on civil society’s response to this transformed political landscape. During the 13th N.P.C. session, Xi pushed through one of the biggest reorganizations of the Party-state bureaucracy in the reform era, to make the government, in the words of China’s Xinhua News Agency, “more efficient and service-oriented.” Organizational changes relevant to civil society included the elevation and revamping of ministries and commissions working on environmental protection, health, and justice. These agencies work on and regulate areas that are the focus of many NGOs in China. A new Ministry of Ecology and Environment will take on a larger range of oversight responsibilities than its predecessor, the Ministry of Environmental Protection (MEP). Responsibilities for healthcare and coordinating national health reform will be consolidated under a new National Health Commission, which will replace the National Health and Family Planning Commission. The Ministry of Justice will absorb the State Council Legal Affairs Office, and play a primary role in advancing law-based governance, one of Xi’s main initiatives. In addition, a new International Development Cooperation Agency was established, taking over coordination of foreign aid responsibilities previously shared by the Ministry of Commerce and Ministry of Foreign Affairs. This agency will play an important role in supporting China’s global diplomacy initiatives such as Belt and Road. While NGOs currently have no clear role in the delivery of Chinese foreign aid, Chinese NGOs have begun internationalizing their work, and government outsourcing of foreign aid to NGOs, as happens in other countries, is very much a possibility in the near future. The objectives behind these momentous changes are, in typical Xi fashion, grandiose. As laid out in the 19th Party Congress report, they include returning China to its proper role as a great power, or what the report refers to as “national rejuvenation,” consolidating the power of the Communist Party, and raising living standards for the Chinese people by moving beyond basic economic security to improving their quality of life. This requires tackling the principal contradiction or problem in Chinese society, which in the words of the report is “the contradiction between unbalanced and inadequate development and the people’s ever-growing needs for a better life” so that China can achieve a “moderately prosperous society” by 2020 (the centenary of the C.C.P.’s founding), “socialist modernization” by 2035, and become a “socialist modernized great power” by 2049 (the centenary of the P.R.C.’s founding). These are heady aims, and Xi has made a big wager on a strong, centralized, law-based, people-centered Party apparatus monitoring bureaucrats, businesses, and society as the solution. If Xi is able to achieve those aims, he will truly have taken China into a “new era of socialism” and be worthy of standing on the same platform as Mao and Deng. Xi’s initiatives raise some serious concerns. Among them is whether they contain their own principal contradiction: Even as Xi seeks to strengthen the Party, he has also sought to concentrate power in his own hands, and in the process undermined norms of collective leadership and succession that were seen as hallmarks of the Party’s authoritarian resilience. Xi’s answer to this contradiction seems to be that a strong leader is needed in order to reshape the Party into a resilient, accountable, innovative governing institution staffed with loyal, honest bureaucrats who believe in the Party’s mission and are engaged with the masses. It is a top-down logic in a top-down system that inspires numerous questions. How does a strong leader ensure that his institutional reforms survive his tenure? Can Party-state resiliency, accountability, and social engagement be achieved through command-and-control systems? Or will Xi’s policies leave civil society in a place where it will be able to have a consultative and participatory role in securing the Party-state’s reforms? Minzner is right that Xi’s strategy has been to undercut bottom-up reforms, seeing them as inviting official corruption and social instability. But it is also true that Xi has not reabsorbed civil society back into the Party-state, nor could he even if he wanted to. Chinese civil society has shown substantial growth over the last four decades (despite the crackdown on the pro-democracy movement in 1989, Falun Gong in 1999, and Charter 08 in 2008, along with episodic repression against ethnic minorities, underground churches, labor activists, and independent NGOs). Over the last two decades, environmental activists helped stop dam construction on the Nu River in Yunnan and raised awareness about air pollution. Women’s rights activists helped shape the Anti-Domestic Violence Law passed in 2015 and fought gender-based discrimination. Labor activists helped organize workers to bargain collectively in factories. Over the past decade-and-a-half, private foundations, started by entrepreneurs, have jump-started a culture of philanthropy that has only continued to grow since a new law regulating charities was implemented in 2016. After the 2008 Sichuan earthquake, NGOs, foundations, and volunteers came together in a rare public display of bottom-up assistance to a major disaster. By 2012, when Xi became the General Secretary, Chinese scholars estimated there might be more than a million civil society organizations, many of them unregistered. What have received less attention are the carrots being offered to civil society. These come in the form of high-level recognition and support for civil society as redefined by the Party. In his analysis of the 19th Party Congress report, Wang Zhenyao, Dean of the China Philanthropy Research Institute at Beijing Normal University and a former Ministry of Civil Affairs official, was heartened that the report recognized the role of “social organizations” (the Party’s term for civil society organizations) and their role in building “social governance” and “socialist consultative democracy.” These concepts call for civil society to play a consultative role in strengthening community self-governance and mechanisms for resolving social tensions—with the precondition that this consultation happens under the Party’s leadership. In addition, the 2016 Charity Law and other regulations, which opened up opportunities for public fundraising, charitable trusts, and government contracting, are providing a large infusion of domestic financing to qualified civil society organizations. This is particularly true for those organizations working on government priorities. Those priorities include poverty alleviation domestically and Belt and Road internationally. Prime Minister Li Keqiang’s work report at the 13th NPC also expressed support for child welfare protection, the elimination of discrimination, and environmental protection as other priority areas for civil society. To some analysts, the objective of this combination of carrots and sticks is clear: the co-optation of civil society. By privileging certain types of NGOs, the spate of NGO laws and regulations that came out in 2016 all point in this direction. The recent drafts of registration and management regulations for social organizations, for example, promise to do away with the dual management system that requires social organizations to get a government sponsor before they can register. But this preferential treatment is limited to organizations working in certain areas, such as commerce, science and technology, public welfare and charity, and urban and rural community services. Similarly, the Charity Law allows social organizations to apply for charitable and public fundraising status as long as their work falls in the recommended “public welfare” or “charitable” fields. These fields are explicitly defined as: poverty alleviation, eldercare, aid for orphans, aid for the ill, assistance for the disabled, disaster relief, education, science, culture, health, sports, environmental protection, and “other public interest activities compliant with the provisions of this law.” Of course, the last item leaves open the possibility that work in other fields will be permitted, but the government’s preferred role for civil society is reflected in what is explicitly stated. Conversely, the more independent and vocal grassroots NGOs—those that worked on the wild side in rights protection and advocacy, and were denied the ability to register as social organizations and therefore had to register either as businesses or remain unregistered—face a challenging environment. In the past, these NGOs relied heavily on overseas funding for their activities, but the Foreign NGO Law makes it very difficult for overseas NGOs to fund or partner with local NGOs that are not registered as social organizations. Foreign NGOs that have successfully registered a representative office in China report that authorities will not allow them to continue to fund for-profit domestic enterprises, a restriction aimed directly at cutting off funding for domestic NGOs registered as companies. In the same vein, foreign NGOs that wish to file for “temporary activities” need to work through a Chinese partner, which can be almost any kind of organization except a for-profit enterprise. Domestic NGOs can still accept funds from foreign governments and embassies, but those funds are getting scarcer as foreign governments reduce their aid to an increasingly prosperous China. Starved of funds or partnerships with foreign NGOs, grassroots Chinese organizations face difficult choices. They must modify their activities in order to get registered, accept funding sources that do not comply with the law, or downsize, otherwise they may even have to make the decision to close down. These laws and regulations, meant to keep NGOs in line, will be supplemented by the new social credit system currently being established to monitor and regulate the behavior of individuals, companies, and organizations in China. The Ministry of Civil Affairs announced in January the adoption of the Regulation on Social Organization Credit Information Management, which will set up a management system to deal with social organizations that do not fulfill their obligations or engage in illegal conduct. The regulation mandates the creation of two blacklists, one for social organizations with “irregular activities” (such as not submitting annual work reports to the Civil Affairs bureau in a timely fashion, or not establishing internal Party cells according to the regulations), and another for social organizations that have committed “serious illegal and dishonest acts” (such as falsifying registration materials). The social organizations on these lists will not be able to bid on government contracts or receive financial aid from the government. In contrast, social organisations with good credit will be given priority when bidding on government contracts, or requesting financial and policy support. An open question is whether NGOs can remain independent and thrive once they are integrated into the system. Proponents like Wang Zhenyao argue that integration into the system is an opportunity for NGOs to professionalize their operations, reach a mainstream audience, and cultivate channels to consult with policymakers in improving governance. Critics point out that integration into an authoritarian system leaves NGOs—particularly those working in areas not aligned with government priorities—vulnerable to pressure to conform and be compliant with government dictates. In the words of Renmin University Professor Kang Xiaoguang, “some grassroots organizations, after gaining legal status and being incorporated into the system, soon afterwards face real pressures to compromise or even abandon their own values, reduce their advocacy function and orient themselves towards social service activities in order to ensure their survival.” Others note that there are no specific regulations governing NGO consultation with policymakers, and few resources or opportunities for strengthening their consultative capacity. Co-opted or not, Chinese civil society groups have not been standing still. Small-scale demonstrations of activism continue to take place both on the ground and online. Grassroots NGOs such as Friends of Nature have been filing environmental public lawsuits, which are now allowed by the revised Environmental Protection Law. Workers in Walmart China, Lala van drivers, and Chinese truckers have coordinated online to organize strikes in multiple provinces. Labor activists continue to help workers organize and negotiate collective agreements and are carrying out initiatives to hold the All-China Federation of Trade Unions (China’s official union) accountable. Feminists and LGBT activists are making their voices heard on sexual violence and discrimination. Public interest lawyers continue to defend the growing number of activists being detained. Foreign NGOs have been meeting to monitor the implementation of the Foreign NGO Law and communicating on a regular basis with PSBs and their Chinese partners about registering representative offices and filing temporary activities. Furthermore, a number of new institutions and initiatives have emerged in the wake of the Charity Law to promote philanthropy more widely. Most notably, online fundraising platforms are thriving. One prominent example is Tencent’s September 9 Day of Giving, which raised 1.3 billion renminbi in 2017 from 12.68 million donors to support more than 6,000 charitable projects. As sources of foreign funding dry up and local funding becomes more important, the traditional NGO business model—registering an NGO and applying for funding from foundations and governments—may become less relevant, particularly for those interested in innovating outside of government priorities and the official system. NGOs and activists are looking into resources from less conventional sources, tapping into crowdsourcing, volunteers, and individual donations, or establishing social enterprises that earn income from selling goods and services to support a social mission. Loose networks of like-minded citizens from the middle- and upper-class are supporting activists and artists championing social causes. Civil society is adapting, growing, and thriving in some areas, and under threat and dormant in others. But civil society and its capacity to contribute to bottom-up reforms is not dead. We are witnessing an extraordinary period in which civil society is having to remake itself in a very different ecosystem, explore new ways to adapt, grow, and move forward, and strengthen its capacity to collaborate with government and the private sector while remaining independent. The civil society space is not unlike a forest that has experienced a major fire. Some areas were unaffected and continue to grow, but other areas damaged by the fire will need to regenerate new plants and trees. This will require time, ingenuity, luck, and, above all, persistence. In the long run, there really is no good alternative to a robust, vibrant civil society if China wants to develop into a prosperous and stable modern power. Chinese civil society’s responsibility is thus a heavy one and its supporters should recognize this moment as a critical opportunity to rethink how civil society can adapt and move forward. Despite what its propaganda might have one believe, the Party-state cannot do it all. China desperately needs bottom-up ideas and models to govern an increasingly complex and wealthy society, and when it comes time for the Party-state to relinquish power, it will need, in Minzer’s words, a “moderate, institutionalized political force” with roots in civil society ready to assist in ensuring a peaceful transition.